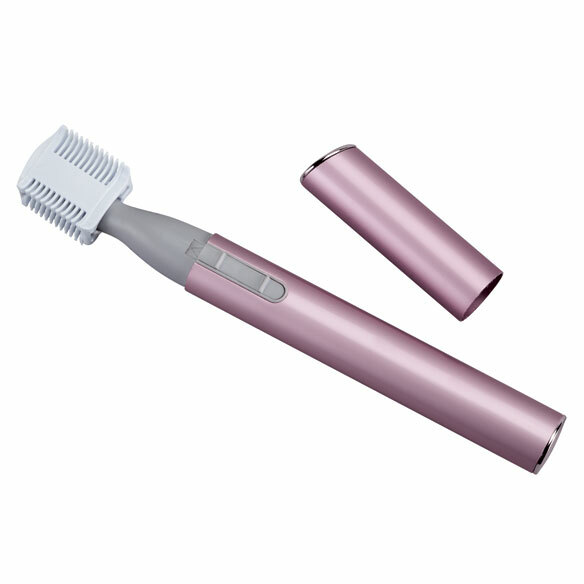 The instant, painless way to gently remove face and neck hair at the skin’s surface. Facial groomer gives you a smooth face and neck and flawless brows without expensive salon visits. 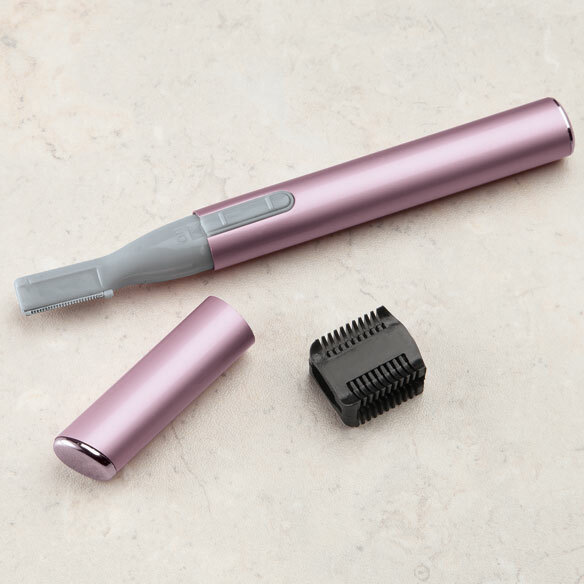 Skin-safe blades eliminate pulling and tugging. Includes bonus brow attachment for shaping. 5”L groomer is easy to use, even with limited dexterity. Includes storage pouch for home or travel. Requires 1 AAA battery (not included). I bought this item for myself but my hubby has been using it for almost 5 years now. It is great for neck hair, hair inside ears and stray brow hairs. Battery lasts a very long time. It has been cleaned after each use with a small brush (the kind used between teeth as a flosser). It enables him to go a little longer between hair cuts. Keeps him well groomed looking. My first one I bought elsewhere. I saw them in the catalogue. I am getting another, maybe two. They are great for us ladies that start getting hair where we didn't used to. Far better than waxing or creams. This isn't exactly like "shaving" so I see no signs of more or darker hair growth. Been using this item for about 2 years. Look like a "real" woman! I've only used it once, but like it. I wish it came with instructions 'cuz I forgot what the other attachment was for. Product is made a little cheaply. It's made of plastic and not metal. I would not have bought two had I known that it was as cheaply made. Quality not as I thought would be. I bought this product to use on my eyebrows. I wear glasses and it's difficult to use tweezers, I thought this would be easier. As soon as I used it, the blade fell right off. Not a good purchase! tried 3 different batteries and it wouldn't work....I've had similar products with no problems....dealing with returning it but I refuse to pay the s&h fee, waiting to see what they say !!!! This came in a plain, white, unmarked box with no manual or instructions of any kind. There is an attachment for eyebrows, but no diagram or instructions for attaching or using it. It does not work at all for stray chin hairs or sideburns. I can't imagine a man using this. All in all, a total waste of money. I only hope that it won't be too expensive to return. It's not worth keeping at all. I had a hysterectomy years ago and facial hair goes with the territory. The Facial Groomer help keep it at bay. It works. Handy little gadget! I use for so many things. Can't live without one! My facial groomer is wearing out..
Hopefully, this will be a great tool to help in shaping eyebrows. I've used one like this for years and love it. This is very gentle for delicate facial hair area. Purchasing two for home & travel. Tho my hair is naturally blonde, I am 68 and old ladies' facial hair sometimes gets a tad longish. I don't wanna look like antone's wicked witch so I GROOM MYSELF, as all women should do. My old one stopped working. it was about 12 yo.